Many secondary school athletes are training for more than 10hrs per week and are competing nationally or alongside adults in events such as The Speight’s Coast to Coast, La Grande Swim, Le Race etc. At a time when they are also growing, young athletes may need as much as 50% more protein than their more sedentary peers. Are Protein and Amino Acid Supplements necessary? Protein is regularly being turned over in our bodies as tissue is built up and then replaced. In adolescence there is more protein synthesis (building) than degradation (loss). So although it does take a lot of protein to build up muscle in an athlete and constantly repair any exercise induced damage, most young athletes do meet their daily protein requirement of 12-15% of total kilojoules. This is helped by the fact that generally athletes have huge appetites and protein is available in a wide range of foods. Normally a 9-13yr old girl or boy would need 0.8-0.9g/kg/body weight respectively while those 14-18yrs would need 0.7-0.9g/kg/body weight. Any athletes that struggle to get this much protein should contact us for expert dietary help. These athletes must take care to ensure that when they remove meat or other animal products they need to replace the protein with alternative foods that have a high level of energy sustainability. When athletes have specific dislikes of some protein foods this can limit their overall choice and therefore the variety of nutrients and energy in their diet can come compromised. Some athletes compete in categories that are weight dependent such as ballet, light weight rowing, equestrian etc. While they may have high protein needs to maintain muscle strength and stamina they also fear that any gain in weight will result in disqualification. This can create an unsafe environment that can lead to eating disorders. The key to protein adequacy can be found in the timing and quality of protein rich foods. Animal based proteins such as meat, milk, eggs, cheese and fish have a high biological value (BV). They are good sources of essential amino acids and are also digested more slowly than plant-based lower BV proteins that are found in grains, beans and peas. Of these plant-based protein sources isolated soy protein does have a high BV which may be useful to athletes. There are 20 amino acids widely distributed in food of which 8 are considered to be essential in the diet because these can not be made by the body and are needed for the synthesis of muscle protein. The amino acid Leucine, in particular is attracting research attention. This amino acid can be found in meat and milk. Milk is made up of 80% casein and 20% whey. The leucine content of whey has been found to be particularly high and is easily digestible. As it also has a high BV a dose of 2-3g of Leucine per day can benefit athletes wishing to build up muscle. This finding has led to the development of a number of commercially available supplements and protein powders. However before they reach for these products athletes should bear in mind that this same amount of Leucine can be found in each of the following foods: 600mls skim milk; 120g beef; 70g cheese; 400g yoghurt; 3 eggs; 130g almonds; 6 cups of cooked rice and 9 slices of bread. As these foods are also a good source of energy, iron, calcium, zinc and many B group vitamins needed by athletes, these whole foods should not be over looked. Are there risks associated with excess protein? Increase sodium intake once again reducing bone density and increasing blood pressure.. Protein bars and cookies do have a place in the training diet as good portable food choices particularly during times of competition or when protein in main meals e.g. lunch maybe unavailable. 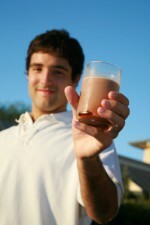 Whey based protein supplements may help increase muscle mass when taken as part of a healthy diet. Some protein shakes, smoothies, flavoured low-fat soy milks do have a place in speeding recovery or aiding energy intake of athletes if suffering from loss of appetite post exercise. Healthy protein rich foods that have a high BV and are also low in saturated fat such as an egg on toast for breakfast, tuna roll for lunch, chicken pasta meal for dinner should form the backbone to a developing athletes diet.